Trash? Or treasure? That was the question in all of our minds as we headed out for a day of paddling and cleaning on the Lower Platte River. Every glint in the water was the chance to find something special. Although most of the items we pulled from the river were cans, plastic, or paper, some of our finds were a bit more unique. Our day started out fairly uneventful as we routinely loaded our boats into the water and drove the cars to the ending point. After snapping a few pictures, we were off. 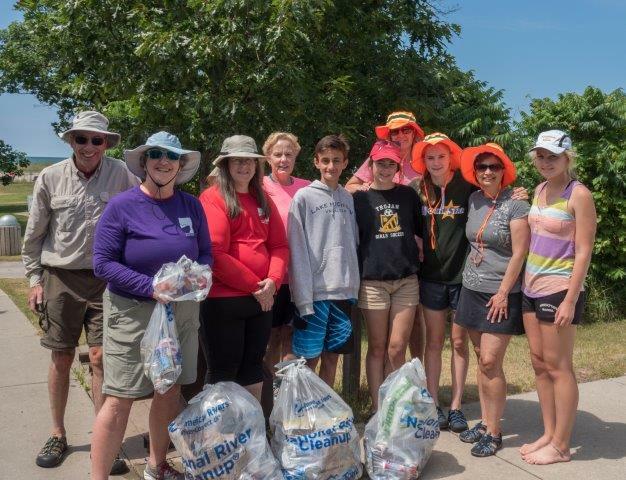 Jackie, Gracie, Lois, John, George, Sharon, Harold, Tracie, Mom, Megan, Marlene, Kristen, Dani and I were on a mission to find as much trash as we could in the stretch of river that we were cleaning. The day quickly switched from usual to unusual when Tracie encountered a snapping turtle while she was trying to collect some trash. Its head was the size of a softball and it even charged her before she could paddle away! Other creatures that we saw were some friendly turtles, and somebody in our group even saw a muskrat! We went to great lengths to collect trash. Many of us stood up or even climbed out of our boats in order to reach a particularly well-lodged bottle. Once we even found twelve identical cans in the same area! Picking up everything required teamwork, grabber sticks, spears, gloves, and no fear of getting wet! We even had to ask the help of some of the tubers going down the river to dive in when the water was too deep. Even though we came out with mainly trash, some of our finds were unique. Car keys, shoes, underwear, towels, tennis balls, and a brand new Frisbee were the most valuable of the items recovered from the bottom of the river. Cleaning both the trash and the treasures was a fun and rewarding experience that gave me lots of laughs and memories. It also hopefully gave everybody a reason to throw their trash in the garbage can, and NOT in the river! Bright and early on the morning of July 8th, me, my mom and Dani, our friend from Spain packed our lunches and our water shoes and headed over to Lois' and John's house. There we met up with Megan, Abby and Julie and we were on our way to the Lower Platte River. 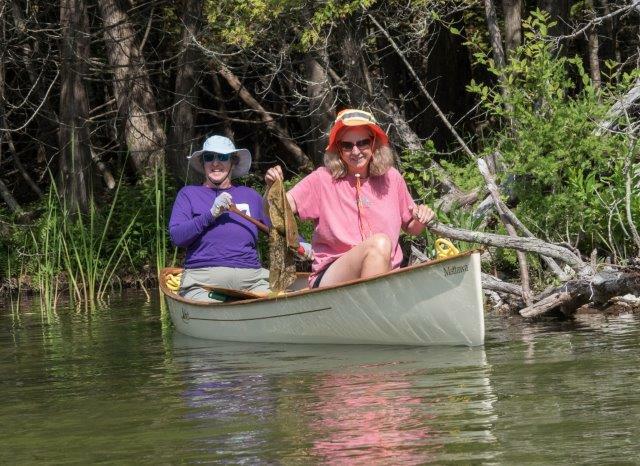 Ever since our first times canoeing with Lois and John the Lower Platte has been a favorite of ours! 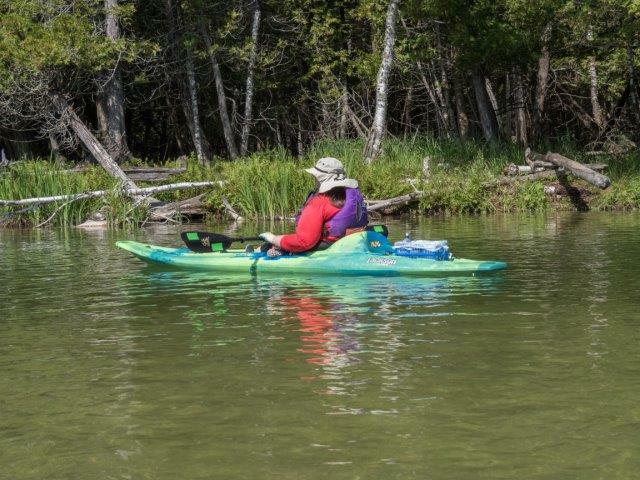 Although it was a bit chilly when we first arrived, the sun was shining making it a great day for paddling. 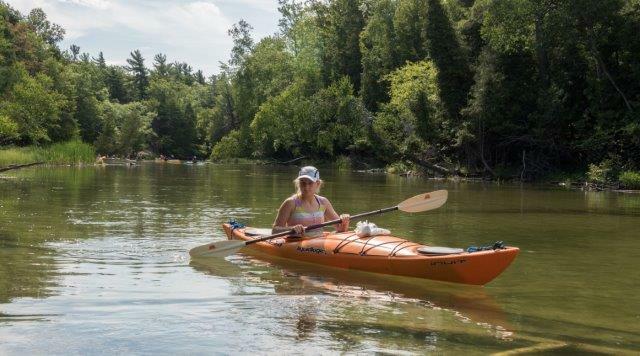 We were met at the put-in by a ranger from the Sleeping Bear Dunes. He took a picture for us and gave us some pins and stickers! While we waited for the shuttle to come back, Megan, Abby, Dani and I picked up trash on the land around the put-in. Throughout the trip we were joined by various wildlife. 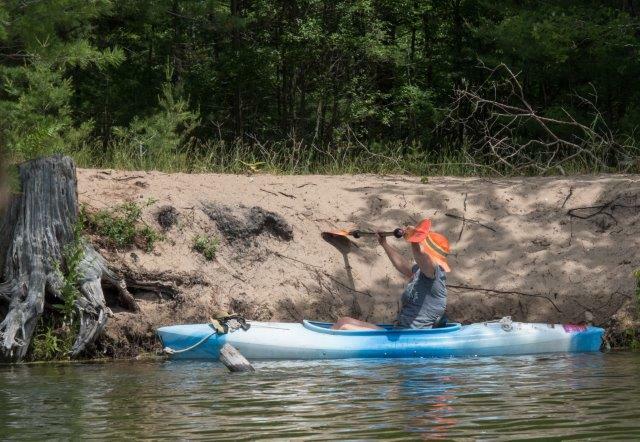 First, we encountered four turtles, including one who came after Tracie! Later on we saw some sea lampreys, lots of birds and some very pesky mosquitoes at the Fish Weir. 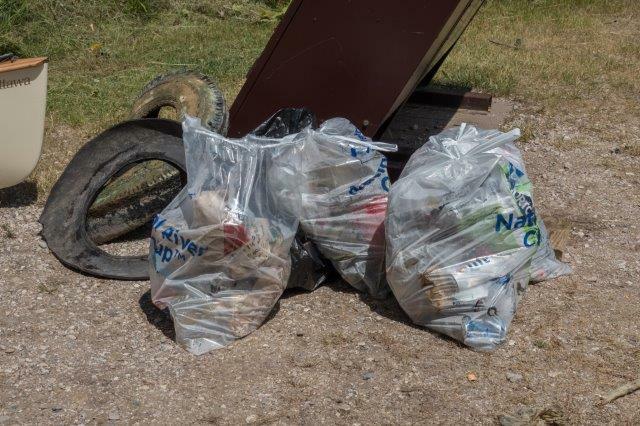 Loon Lake was a particularly good spot for trash hunting! Megan and I were finding cans everywhere we looked! Surprisingly, most of them looked like they had been there for quite a while. Shortly after the lake it was time to stop for lunch at the Fish Weir. Soon we were back on our way headed downstream toward the dunes. 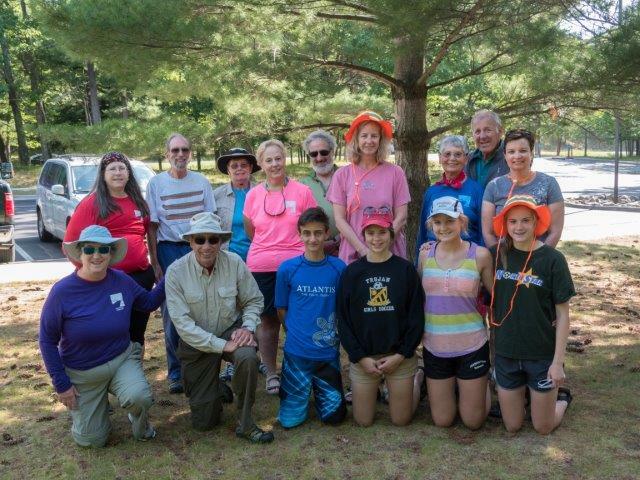 The rest of the trip was filled with other paddlers and tubers, some of who were willing to help us grab difficult pieces of trash! Cans were definitely the main trash that I found on the river. There was quite a bit of interesting treasures that other members of the group found. Tires, shoes, car keys, underwear. There was quite an interesting collection by the time we were finished! We all reconvened at the mouth of the river and headed our separate ways. The trip was definitely another great day on the river! El miercoles, fui a hacer canoa con el paddle club en el rio lower platte. No era una actividad cualquiera, sino una actividad especial anyadida que requeria tener buena vista y ser listo. Esta actividad no iba a ser un simple paseo en canoa por el rio sino, una paseo en canoa sumado a una recogida de basura que podia haber por el lago. En esta actividad formamos parte unas catorze personas para recoger toda esa basura que podia tener el lago. Para mi esta fue mi primera experiencia tanto en canoa como haciendo una recogida de basura del lago. me parecio una experiencia maravillosa, ya que, de esta manera al igual que nosotros pasabamos un buen rato en familia, ayudabamos a tener un mejor medio ambiente del lago en este caso. Para finaizar, quera dar las gracias a estas hermosas personas que son: Jacalyn Anderson, Lois Goldstein, John Heiam, George Hermach, Sharon Hermach, Harold Lassers, Tracie Lord, Marlene Puska, Abby Puckett, Julie Puckett, Megan Puckett, Gracie Failor y Kristen Salathiel, por haberme dado esta gran oportunidad y buena experiencia sobre esta actividad. Despues de haber hecho esta actividad con esta gente tan magnifica me llevo una buena impresion sobre esta gran experiencia. Muchas gracias a todos por mostrarme esta actividad tan magnifica!!!! Harold claimed he could only bring the tire on board because Pam wasn't there to stop him. Our morning treasures - left at the fish wier to be picked up by the rangers. Julie goes after a can high up on the bank. Some of our group at the take out with our afternoon finds. On Wednesday, I went to do the paddle canoe club in the lower Platte River. It was not any activity, but a special activity that required anyadida have good eyesight and be ready. 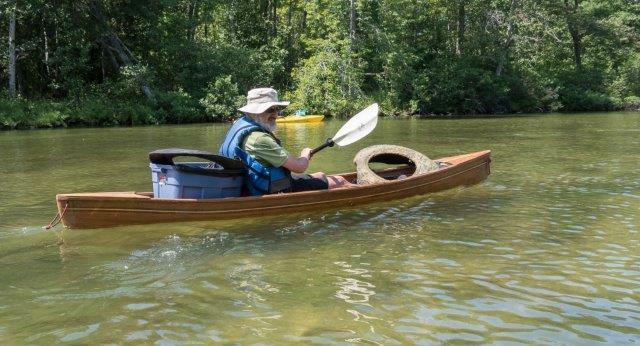 This activity would not be a simple canoe ride on the river but a canoe trip combined with a garbage collection that could be at the lake. In this activity we are part about fourteen people to collect all the garbage that could have the lake. 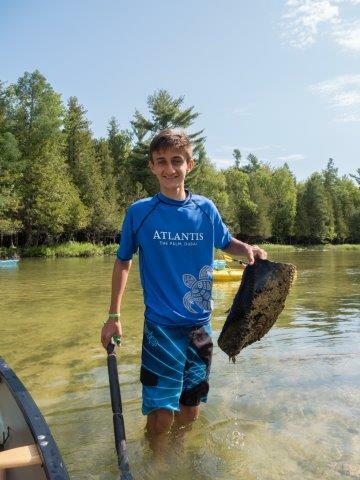 For me this was my first experience in canoeing and doing garbage collection Lake. I found a wonderful experience because, in this way as we passed a good time in family, we helped to have a better environment lake here. To finaizar, wanted to thank these beautiful people who are Jacalyn Anderson, Lois Goldstein, John Heiam, George Hermach, Sharon Hermach, Harold Lassers, Tracie Lord, Marlene Puska, Abby Puckett, Julie Puckett, Megan Puckett, Gracie and Failor Kristen Salathiel, for giving me this great opportunity and great experience in this activity. After having done this activity is so great people I've a good impression about this great experience. Thank you very much for showing me all this activity as magnificent !!! !